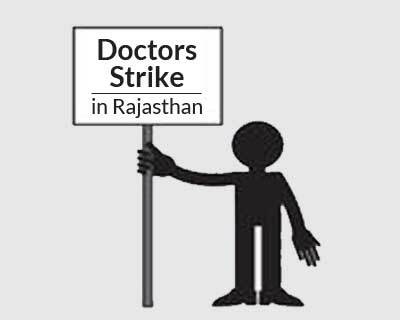 Jaipur: The healthcare services in the state remained crippled for yet another day as the resident doctors strike reported entered day 7. The strike, which is based on a number of issues related to medical education in the state, came into culmination after the government decided to send their answer scripts outside the state for corrections, right before their exams. Meanwhile, situation became further difficult for striking doctors. After the government announced termination of more than 500 resident doctors for strike, this was followed by a massive removal of resident doctors from college levels at various colleges in the state. Many doctors are reported to have been sleeping in cars, dormitories, corridors etc. To add to their misery, at many places local shopkeepers association have also taken against the doctor’s strike and are refusing to sell them with daily necessities. Despite all odds, resident doctors are still not budging from the strike, which they believe is to meet their fundamental requirements as medical students. The doctors are running parallel OPDs outside their respective hospitals. The government has given shown inclination to meeting their demands, but no particular order has come to this effect. “ The government has asked us to join our duties, saying that, only then they will release any order confirming acceptance of demands. In the past, we have had many experiences where the government has verbally promised us something, but never delivered. We want a Written promise this time. Only then, we will end our strike,” said Dr Kuldeep Punia, President Jaipur Association of Resident Doctors. He further added, “the doctors who have been terminated cannot join back till the government takes back its order or issues another order stating that the first order stands cancelled” .